Andrew Johnson’s and Bill Clinton’s impeachment trials; obituaries for Theodore Roosevelt, Vladimir Lenin and Winston Churchill; the beginnings of the Prague Spring and the Arab Spring—and all of it before the end of January! 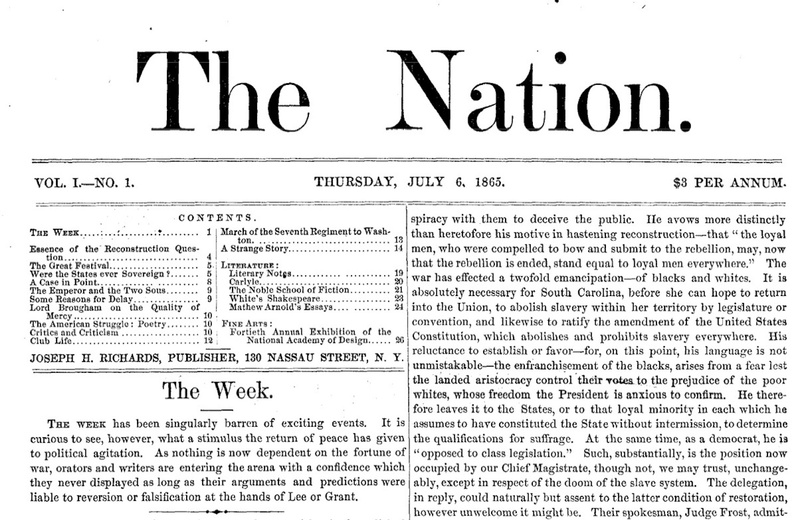 The first page of the first issue of The Nation. Beginning on January 1, The Nation will be launching The Almanac, a 365-day compendium of how America’s oldest weekly magazine has covered important people and events of the last 150 years. For every single day of the year, The Almanac will take a significant event, or the birth or death of a well-known public figure, and excerpt an article The Nation published on the occasion, or by or about that person. As part of the NationNow app, as a feature at TheNation.com and in a daily or weekly e-mail, The Almanac will bring the last 150 years of history to life as never before. Faulkner, by the way, died July 6, 1962. For that date, The Almanac quotes our 1930 review of The Sound and the Fury. “Hardly Worth While,” was the title. Get The Almanac every day (or every week) by signing up to the email newsletter.